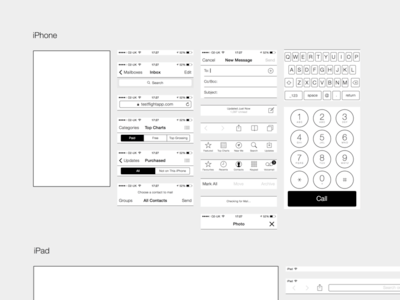 Please feel free to download and use this Wireframing Kit. Use the blank iPhone or iPad screen as a starting point and use Sketch's smart guides to automatically snap the UI widgets into place. There are enough UI widgets to create all kinds of combinations and as these have been drawn from scratch to match the original OS as close as possible (99% pixel perfect) they could be used to create mockups. There is a colour palette included which I find useful for disabled and selected states and other places where black is too strong.